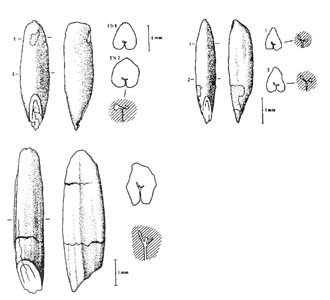 Drawings from the Abu Hureyra publication Hillman in Moore et al., 2000, Village on the Euphrates, fig. 12.6.
top left Secale cereale ssp. 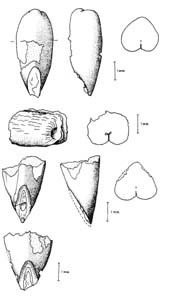 vavilovii. bottom Triticum boeoticum or T. urartu. 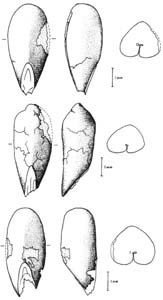 Drawings from the Abu Hureyra publication of rye grains which "closely resemble the forms of domestic rye grown on the Anatolian Plateau" (Hillman 2000:379). These grains have been AMS dated to the Epipalaeolithic levels at Abu Hureyra. Hillman in Moore et al., 2000, Village on the Euphrates, fig. 12.23.